Color(s): Red, apricot, black, cream, white, gray; may be patterned or blended. The Cavapoo, also known as the Cavadoodle, is created by the crossing of two breeds: Cavalier King Charles Spaniel and Poodle. They are often referred to as "designer dogs" and have become popular family companions. One of the most distinctive features of the Cavapoo are the long ears. They are compact, small to medium in size, and possess a round, expressive face. They are typically well-proportioned, agile, and sturdy. The Cavapoo is affectionate, loyal, and friendly. They are good-natured, playful, and social. They do best with older, considerate children. They do well with dogs and non-canine pets. Cavapoo's will bark to announce visitors and out of the ordinary sounds. They are very family oriented and do not do well if ignored or left alone for extended periods of time. Depending on coat type, the Cavapoo requires regular brushing to prevent matting and tangling or professional clipping. It is important to keep the ears clean and the nails trimmed. They may be prone to such health issues as hip dysplasia, eye disease, luxating patella, PRA, skin problems, and epilepsy. 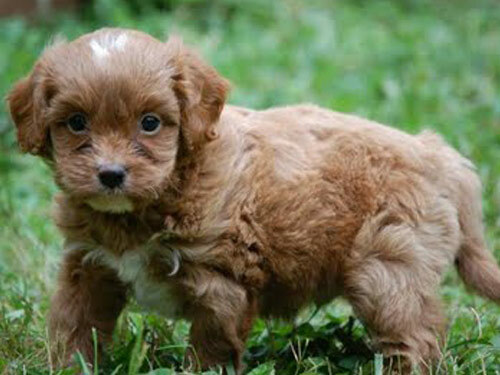 The coat of the Cavapoo may be curly or soft, silky, and slightly wavy. Early socialization and obedience are recommended. The Cavapoo may be difficult to housetrain. The crate training method works best. They will not respond to harsh or heavy-handed methods. Training must be done with firmness, fairness, patience, and consistency. The Cavapoo is well suited to apartment living provided they are sufficiently exercised. They thrive on daily securely leashed walks, off-lead play in a securely fenced yard, and family play sessions.